The village mayor has discovered a magic word that will expel the werewolves from your midst forever. But the mayor is also incompetent, put in power as the figurehead of an influential family, and his memory is not what it was. Upon discovering the magic word, he has forgotten what it is. Now it is your role, as a well-intentioned citizen of the village, to help the mayor jog his memory and rediscover the magic word. Then again, maybe you like the werewolves. Maybe you are one, or maybe you like that the werewolves generate business for your souvenir shop. Maybe you think it’s better that they’re here in your village. Maybe you show up to town hall meetings just to obscure and mystify the proceedings, derailing valuable conversation with personal anecdotes that have no relation to the business at hand. Whatever your motive, the village needs you. Will you answer the call? 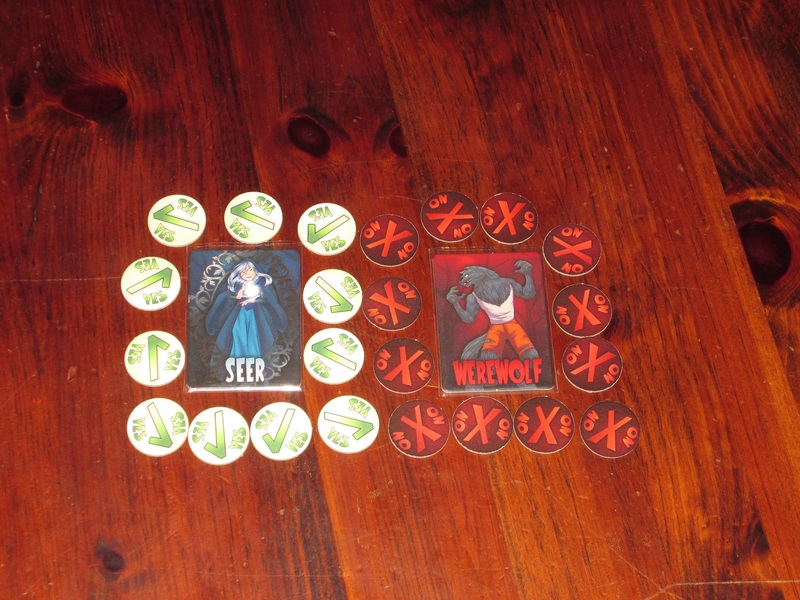 Werewords is a social deduction guessing game for four to ten players. Players are members of a village on either the villager team or the werewolf team, trying to either guess the magic word or prevent it from being guessed, respectively. The team that reaches their goal without being discovered by the other team is the winner. 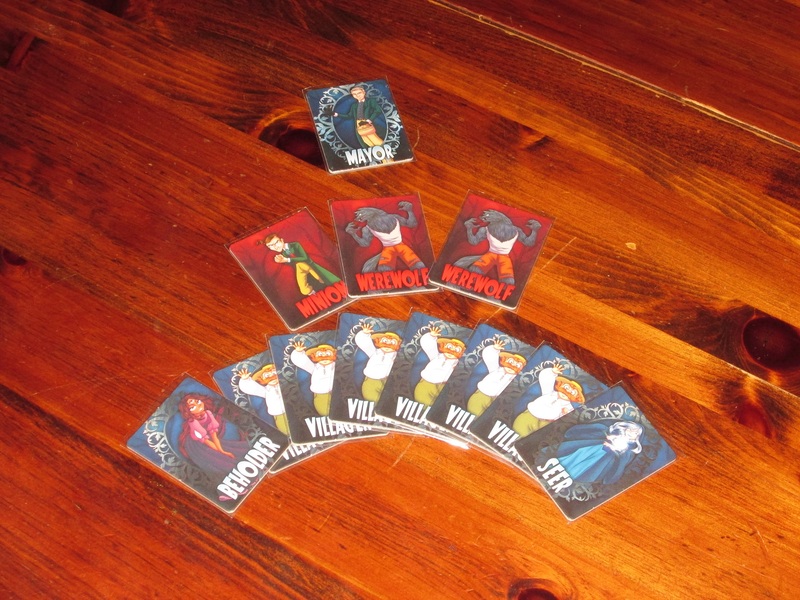 To begin, mix together the mayor card, a werewolf card, and the seer card, plus villager cards to equal the number of players +1, then deal one card to each player, placing one card face-down in the center of the table. The player who receives the mayor card receives the Yes/No, Maybe, So Close, and Correct tokens, takes the face-down role from the center of the table, and starts the app. 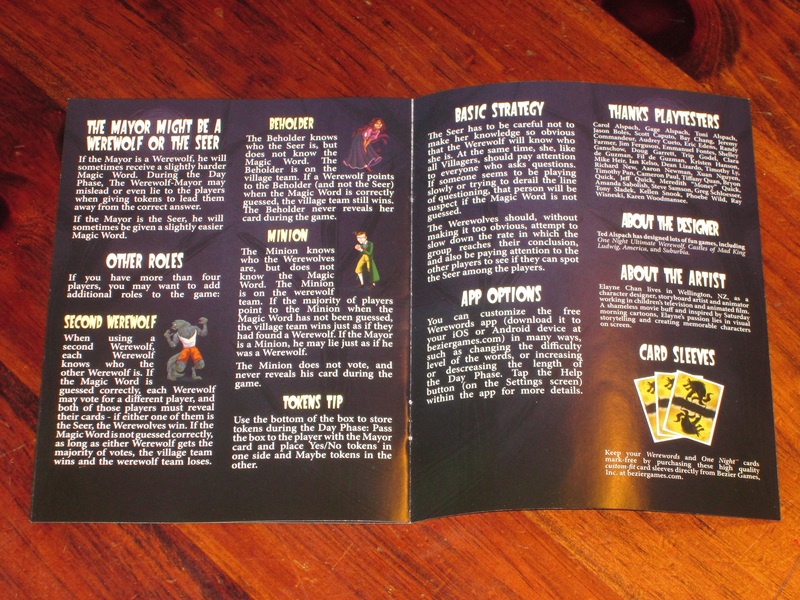 The role cards in Werewords. The app will instruct all players to close their eyes and the mayor to tap his or her role and choose a word. The seer and werewolf will view the word during this time as the app instructs. After this, players have four minutes to discover the word. The mayor is not allowed to talk and may only hand out tokens, so players have to ask yes or no questions to discover the word. If players discover the word before time runs out, the werewolf can still win if he or she correctly identifies which player is the seer. If the players do not discover the word before time runs out, the villagers can still win if they correctly identify the werewolf by a majority vote. The premise of Werewords might sound familiar, especially if you’ve played Insider from Oink Games. Indeed, there was some controversy around Werewords’ release on just this point, but I’m not here to pass judgment on controversies. I’m here to answer the question, Is Werewords any good? And the answer to that is yes. Absolutely. The seer and werewolf have to be careful not to be obvious. A seer who always asks pertinent questions or a werewolf who always derails the conversation is easy to spot. Tokens make it easy for players to track who has been helpful. Insider is one of my favorite games from the last year, and I’ve played it forty or more times. I love it. However, Insider has some rough edges that have made certain rounds unsatisfying. For example, some of the English words included in the game are a little strange to an American audience. (We house ruled that the master could choose a new word if the chosen word was too awkward.) Also, the Insider is supposed to get the group to guess the word, but there’s little in the game to punish the Insider if he or she fails, and the rounds where the Insider fails are less interesting for the group. Werewords addresses these problems directly. It adds complexity, yes, but it also feels like a more polished game, for better and worse. What falls into the “better” category is the required app for Werewords. I know: some people still balk at apps being required for board games, but for Werewords, this is a huge boon. Not only does it make narrating the night phase easier (and less prone to error), the app also offers a near limitless supply of words. There are 10,000 words included on the app currently, and new words are always being added. If you’re unsatisfied with this slate of words, you can even upload your own lists on the game’s website. (I did this for my family Christmas celebration over Thanksgiving so we could play with a Christmas-themed word bank.) In addition to a larger word bank, players can choose a difficulty they’re comfortable with, and the mayor is provided several options when choosing a word. There can be some teething issues here as players discover which difficulty level is right for their group, but the app is still an excellent tool in managing the game. The rules of the game, though more complex than Insider, are still straightforward, and the rulebook provides hints to new players. I also like the more polished end game. The one hiccup in explaining Insider to new players is that the Insider sounds like a traitor, yet the Insider is supposed to help the players guess the word. But the Insider also wants to remain hidden. Werewords, while adding more roles, also simplifies the conceit: there are bad players trying to sabotage the guessing and good players trying to help it. 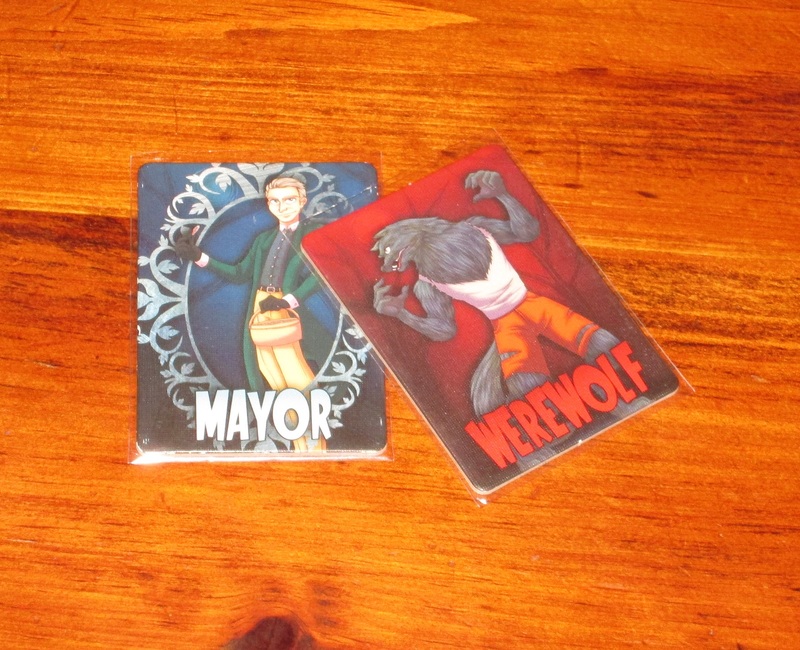 There’s also the twist that the mayor can be a mayorwolf (or weremayor–my coworkers are split on the term), which opens some new and interesting game space. By including both teams with different aims, the game always comes down to a vote, even when the guessing fails. I like this. 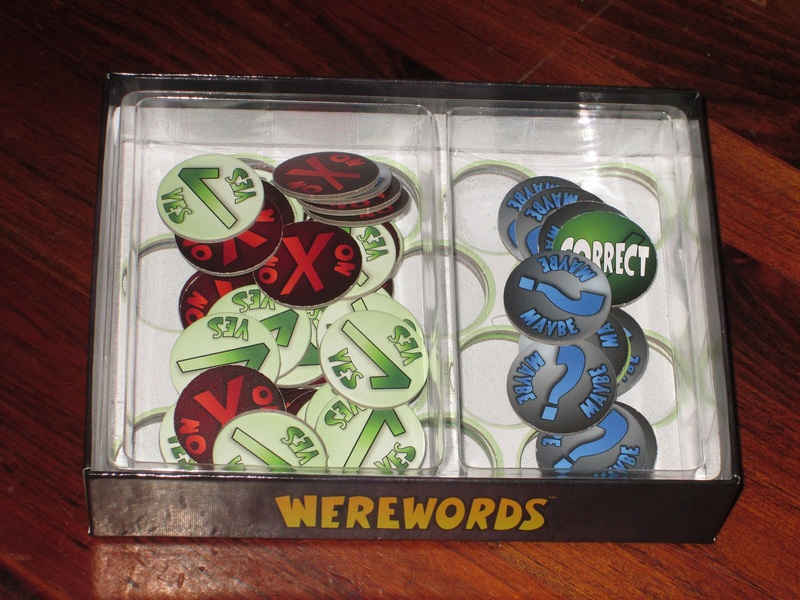 The Werewords insert is a nice receptacle for the mayor’s tokens. You can just pass the box to the mayor. This is a nice touch. The tokens are a nice touch, too, because it was always difficult to rein in the Master in Insider by saying, “You can only say yes or no!” Some players I’ve played with like to see things in many shades of gray, which can make the game more philosophical than it’s intended to be and which means there’s usually additional information given. In Werewords, you can simply say, “No talking; use the tokens,” and there are even a few maybes and a “so close” token included. While there is still some hemming and hawing suggesting gray areas, this problem is more contained in Werewords. From what I’ve said so far, you’re probably thinking, I like the 20 Questions with a traitor idea. Werewords sounds like a no-brainer! And that’s true. Yet for all its positive qualities, there’s something about it that feels…missing compared to the earlier Insider. I’ve tried to put my finger on it as I’ve played many, many games of Werewords, and the words keep eluding me. (Must be werewolves.) There’s a spark in Insider that I haven’t seen reproduced in the more-polished Werewords. Maybe it’s the magic of a tiny box opening a brand-new realm of gaming possibilities that I miss here, or maybe it’s just that it got there first, but I have a fondness for Insider that I can’t shake, even with all of Werewords’ bells and whistles that make it (almost objectively) better. A mayorwolf? Or is that a weremayor? In either case, watch out! There’s also the issue I mentioned above with the app. Having different difficulties of words is a boon to the game, but it can lead to some unsatisfying rounds while you calibrate the difficulty to your group. Some groups I’ve played in have found only the hard words to be the right level of challenge; in other groups, much beyond easy, the players are groaning about the impossibility of the challenge. It’s necessary to push past these few practice rounds to find the fun. But in my experience, it’s worth it to do so. 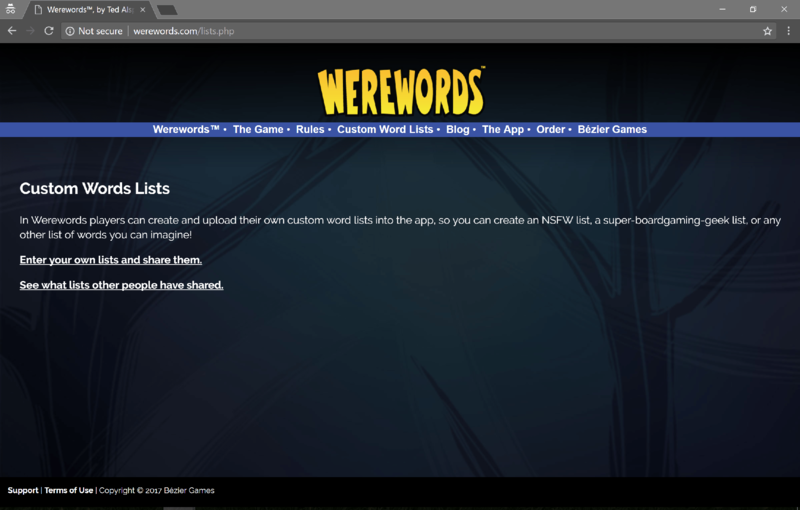 The Werewords website offers great customization features, including custom word lists, making the app even more useful. Werewords’ components are good. I like the tokens, and the app is very well done. I’m not a huge fan of the cartoony art on the cards, but that’s a minor gripe. It’s a bigger package than Insider, which means it’s not as portable, but it’s still a small box that’s easy to throw into a bag. The game advertises play for four to ten players (and the app expands possibilities to eleven), and I’ve played with most of the counts in that range. It’s harder for players to hide in a smaller game, so I’d only play in smaller groups with players who are comfortable being singled out. I’m not a huge fan of the Beholder and Minion roles (I think they add unnecessary complexity to the game), and at least one of these will be in the largest games, but that’s not a deal breaker. Werewords takes a fantastic concept (20 Questions with a traitor) and builds a satisfying game around it, one that even players who might usually be averse to social deduction games are likely to enjoy. The huge word bank with varying difficulties is a huge selling point, and the app makes playing the game a smooth experience. The ability to add lists of your own (or lists that other players have written) is a major benefit, too, making Werewords the kind of game you can play at work parties or in foreign language classrooms or at family Christmas celebrations or wherever–you can tailor the experience to just what theme your group is looking for. 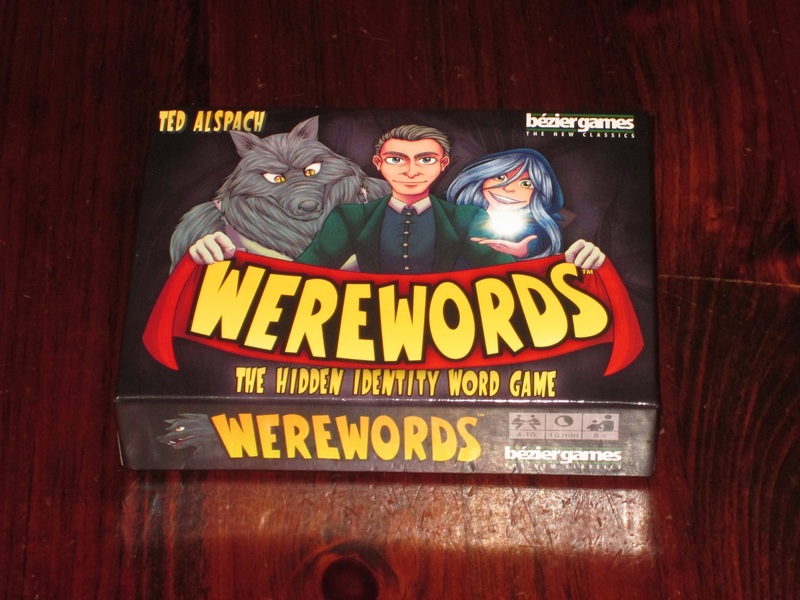 Werewords joins Insider as one of my all-time favorite party games. Even though they cover similar ground, I think there’s room for both in my collection as Insider is significantly more portable and thus is easier to always have on hand, no matter where I am. But when I’ve planned ahead and brought a gaming bag and my tablet with me, I will likely bring out Werewords.